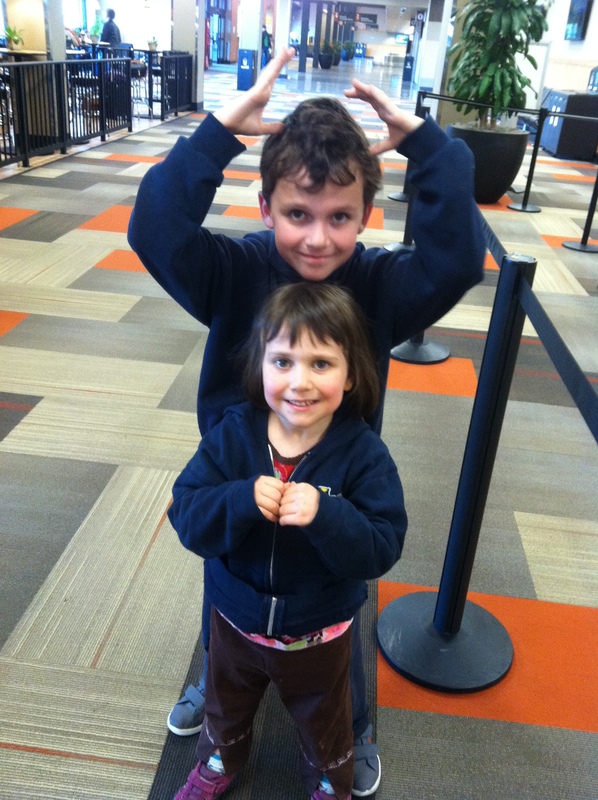 Last week was our spring break, and the kids and I headed north to visit my mom while Matt flew to Australia for work. This kind of thing is why I make no pretense that our car-free, zero waste schtick is carbon neutral. That said most of our travel is for business, and I believe I speak for both of us when I say that a tax on business travel that would ensure we did far less of it would be pretty awesome. 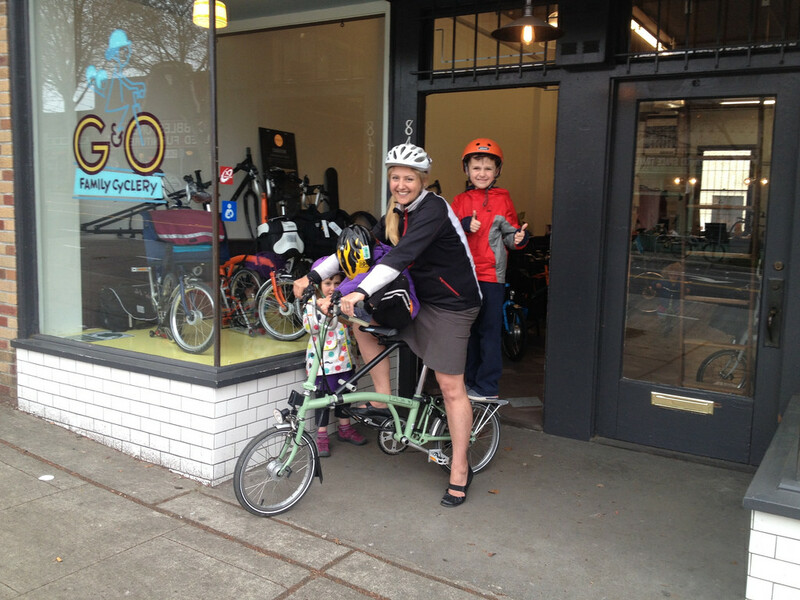 Madi demonstrates the two-kids-on-a-Brompton option. Nonetheless it was nice to have the bike once we got to Seattle. However I was surprised to find that despite the photos I have posted, even people who know family biking were impressed that it is possible to carry two kids on the Brompton. It’s fun, although not something I would do regularly on long rides. And I asked my son to run up the hills because I’m not the rider I used to be. And this brings me to: hills. Seattle is a hilly city, but hills in Seattle are different than hills in San Francisco. A lot of San Francisco was built on landfill, which means that there are large chunks of the city (e.g. the Marina, the Financial District) that are perfectly flat. San Francisco doesn’t have a fixie culture because everyone is a masochist. It has a fixie culture because it’s possible to live without ever leaving the Mission. However once you want to go somewhere else, it gets tricky. The hills loom like walls, and although it’s possible to thread the needle sometimes using routes like the Wiggle, eventually people like us who go to work in offices (in Laurel Heights) and have kids in school (on the other side of Lone Mountain) have to start climbing. And San Francisco hills take no prisoners. Once we load 1-2 kids on deck, even with an assist we’re working hard. So riding in San Francisco is often: la-la-la-la-OMFG-OMFG-OMFG-wheeee!-la-la-la, etc. Seattle is hilly in a more consistent way. In comparison to the totally-in-your-face hills of San Francisco, Seattle’s hills feel almost passive-aggressive. They meander up and down and up and down and up and down and up and down and up and down. I kept wondering where the steep hills were, because from my perspective there weren’t any. However the relentless low-key up and down is not the kind of terrain I’m used to riding and it wore me out (this has happened before—I got smoked by Madi from Family Ride on a deceptively mild-looking but seemingly endless hill in August 2012, while being fried by the equally foreign 80+F temperatures). Bullitt-surfing is understandably more of a San Francisco thing. From the hill perspective, if riding in San Francisco is like occasionally ripping off a band-aid and screaming in agony, then riding in Seattle is like slowly peeling band-aids off by the dozen while feeling the adhesive tug on every single hair. Except that riding bikes is way more fun than that, of course. There’s nothing wrong with having to make an effort, it proves I’m alive and makes me stronger. I’m sure that if we lived in Seattle I would get used to Seattle hills and find them normal. Admittedly sweating on the way to work is a non-starter in my life, but this is why the universe has provided electric assists. And speaking of assists, on this trip we stopped by the newly-opened G&O Family Cyclery, which had the Holy Grail of assist comparisons available for test rides: a Stokemonkeyed EdgeRunner and a BionX EdgeRunner. I love EdgeRunners (I-will-not-buy-another-bike-I-will-not-buy-another-bike-I-will-not-buy-another-bike) but had never tried an assisted version before. They are even better than the unassisted versions. We took the stoked and BionX EdgeRunners up and down the hills of Seattle, and if it wasn’t the same kind of challenge we face in San Francisco, it was still a fascinating experience. My dissertation advisor had five mottos. One of them was, “Whenever you go away on a week of vacation, there’s always two weeks of work waiting for you when you come back.” Alas, this is painfully true, so coming soon: BionX v. Stokemonkey. I look forward to your review of the electric assists. Hee hee, I’m one of those family bikers who doubted the three-on-a-Brompton feat despite having seen the photographic evidence. I thought you just did it for fun around the block (and had gone somewhere to find a _flat_ block), but not as actual transportation! It’s amazing. And fellow Hum of the City readers, the photo of me is deceiving: I stood still on the Brompton with two kids; I convince the rear kid to dismount before I got rolling! Also, I have no memory of you getting smoked on any hills ever! But you’re kind to pretend. I’m OK with you laughing at our little hills. I put my bike (my old, small bike) to go up Queen Anne with one kid today. I wouldn’t call Seattle hills little–it’s a pretty steep city by national standards. It’s only when people in places like Chicago talk about their hills that I stare in disbelief. Ha — I think we need an “I will not buy another bike” support group. I’m super excited for our [non-assist] Edgerunner, which should be here in a just a couple more weeks, but I’m already drooling over other options. 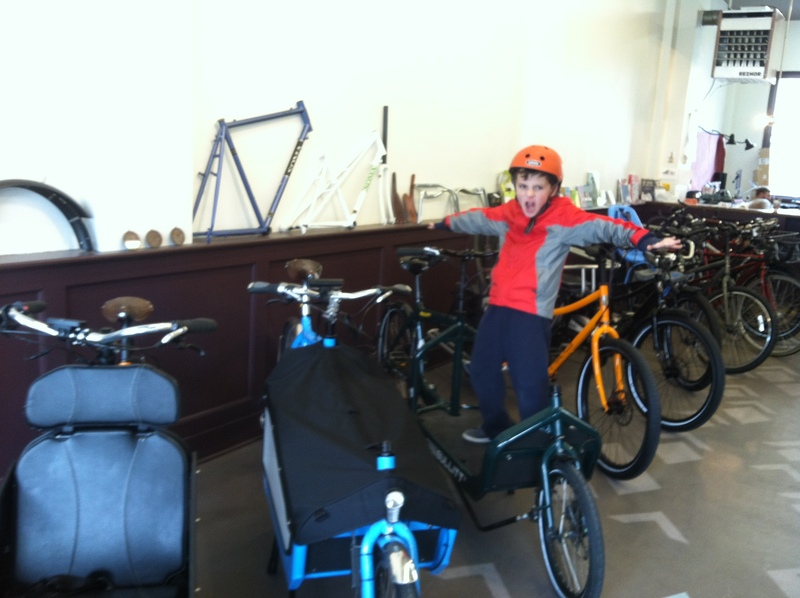 Mostly, I’d love to have your Brompton, something small and portable with the front seat for my little guy. Unfortunately, “small and portable” does not equal cheap! I am very eager to hear about about Stoke vs BionX experience as I am right now trying to price out a Stokemonkey based Edgerunner. It seems Grin/Ebike.ca is ‘the place’ for Stokemonkey-Edgerunner hackery. (along with a freewheel crank and a CVT).. The Bionx specs feel a little bland when compared to the tech on that thing.. Please let me know about your experience soon before I write a check? Now I’ll ride up any hill (I’ve even gone up Queen Anne, though there may have been walking). Seattle has fill, & it’s filled with some of our old hills, so it could be worse! I’ll keep heading uphill. I can’t wait to go electric, though. Oh my! I require more information on your experiences on Allegiant airlines with a Brompton. I need to fly with one per passenger. Were you required to pay for an extra carry on, or did you check it? Did they give you any hassle? Any information would be greatly appreciated!! After an hour of negotiation and being yelled at, I was allowed to gate check it without an extra fee. It would be a gross understatement to say that they gave me any hassle about it. It was the worst flying experience of my life. Once we had boarded they followed us onto the plane and insisted that I sign a waiver absolving them of any responsibility or they would kick us off the plane. They terrified my children. I will never fly Allegiant again. Thank you for your reply. That sounds atrocious! I cannot believe they would treat a client so poorly. I truly appreciate your response, as it prevented me from attempting to fly with out Bromptons. Southwest seems to be really Brompton friendly, at least.